Context: Periodontal disease is caused by chronic infection inducing an inflammatory reaction leading to breakdown of tooth-supporting tissues. There are various risk factors for the disease, and smoking is one of them. Apoptosis plays a critical role in the regulation of inflammation and host immune response which helps in tissue homeostasis, and a disturbance in this is often associated with disease. The imbalance between the apoptosis and proliferation in the periodontal tissue results in periodontal disease. Neutrophils play an important role in the defense mechanism and are the most abundant immune cells in gingival inflammatory infiltrate in patients suffering from periodontal disease. Neutrophil disorders are associated with rapid destruction of periodontal tissues. Aim: To study the influence of smoking on apoptosis of neutrophils by quantifying them in the gingival connective tissue of smoking and nonsmoking subjects suffering from chronic periodontitis. Materials and Methods: Thirty gingival biopsies were harvested from 15 smoking and 15 nonsmoking subjects who suffered from chronic periodontitis. The apoptosis of neutrophils was assessed and quantified using p53 monoclonal mouse antihuman antibody. Statistical Analysis Used: Chi-square/Fisher'sexact test was used to find the significance of study parameters on a categorical scale between the two groups. Results: Neutrophil apoptosis was significantly more in the group of nonsmokers. There was no statistical difference between plaque and bleeding index, but there was a significant increase in clinical attachment loss among smokers. Conclusions: The study reveals that smoking plays a significant role in the inhibition of neutrophil apoptosis, thereby contributing to the destruction of periodontal tissues in periodontitis. Neutrophils are the most abundant immune cells in gingival inflammatory infiltrate in patients suffering from periodontal disease. Circulating neutrophils have a short half-life and the onset of the apoptotic process is associated with the loss of several functions such as adhesion and phagocytosis, which eventually lead to the clearance of these cells from the lesion by macrophage ingestion, thus promoting the resolution of inflammation. The tendency to undergo apoptosis in periodontal lesion prevents neutrophils from lingering at the sites of infection and limits the proinflammatory potential and tissue damage. Previous studies have suggested that neutrophil apoptosisis involved in the pathogenesis of chronic periodontal disease. , The mechanism of death of neutrophils and the control of the functional lifespan of neutrophils in the gingival crevice and periodontal pocket are important to understanding the pathogenesis of periodontal diseases. Smoking is directly related to the incidence and prevalence of a variety of medical problems including cancer, and pulmonary, cardiovascular, and gastrointestinal disease. It has also been identified as a potential risk factor for periodontal diseases. A relationship has been demonstrated between exposure to smoking and the prevalence and severity of periodontal disease. Smoking exerts various effects on neutrophils; for example, oral neutrophils harvested from the saliva of smokers show impaired phagocytosis. Furthermore, morphological changes related to smoking have been demonstrated in both oral and peripheral neutrophils. The aim of this investigation was to study the influence of smoking on neutrophil apoptosis in periodontitis subjects and to quantify the apoptosis of neutrophils in the gingival connective tissue in smoking and nonsmoking subjects suffering from periodontitis by an immunohistochemical method. The study population consisted of 30 subjects suffering from chronic periodontitis who were divided into two groups according to their smoking habits, persons who never smoked (n = 15) and subjects who smoked (n = 15) one or more packs of cigarettes daily for at least two years. The nature and purpose of the study was explained to the subjects and written informed consent was taken. On the day of specimen collection, the periodontal parameters like bleeding index (Ainomo and Bay), plaque index (Silness and Loe), probing depth, and attachment loss were recorded using a UNC15 periodontal probe. The inclusion criteria for periodontitis was the presence of bleeding on probing, probing pocket depth ≥5 mm, and the presence of clinical attachment loss of ≥3 mm in a minimum of two sites. The following subjects were excluded: Those who had any underlying systemic disease, those on any medication, those with a history of periodontal treatment from the past six months, or those who were pregnant. The biopsy specimens were stained with hematoxylin and eosin. They were fixed in 4% buffered formalin and embedded in paraffin section (3 μm), cut and mounted on glass slides, and air-dried at 56°C overnight; then, they were dewaxed in xylene placed in decreasing concentration of alcohol for rehydration. Antigen retrieval was carried out by immersing the slides in whole buffer and incubating in an enzyme retriever (Biogenex) for 95°C for 10 minutes. The endogenous peroxidise activity was blocked with 3% hydrogen peroxide in phosphate-buffered saline (PBS) containing Tween [PBS, 50 mm sodium phosphate ph 7.6, 200 mm sodium chloride (Nacl), and 0.1% Tween 20] for 15 minutes and rinsed, and nonspecific binding of immunoglobulin G (IgG) was blocked with 5% normal swine serum (NSS, lot 107, Dako A/S, Glostrup, Denmark) in PBS plus Tween. Then, the primary antibody p53 (1μg/mL) was added and incubated at 20°C for one hour. The antibody was diluted in 5% NSS in PBS plus Tween. The sections were rinsed again and overlaid with the secondary antibody for 45 minutes. The immunoperoxidase labelling was performed using the avidin-biotin complex (ABC).The sections were then incubated with chromogen (3.3′-diaminobenzine tetrahydrochloride 0.05%, Dako A/S, Glostrup, Denmark) and 0.001% hydrogen peroxide in PBS. The process was stopped with cold tap water and the sections were counterstained with Mayer's hematoxylin for three minutes and dehydrated in a graded alcohol series, cleared in xylene, and mounted in pertex. The stained slides were first screened and the areas for examination were determined by the observers, using a light microscope (Leica DMRB) equipped with a digital video camera. 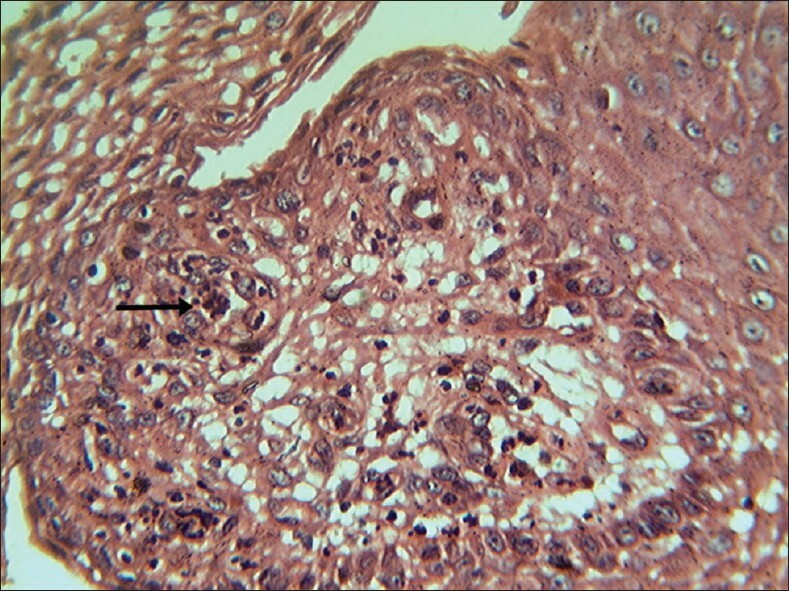 Each section was analyzed for the p53-positive stained cells in the connective tissue. Neutrophils were quantified in the connective tissue. The areas chosen for quantification were captured through the charge-coupled device (CCD) camera and transferred to the computer. All the neutrophils were manually counted in every area sampled and the number of positively stained cells was divided by the total number of cells present. The level of expression of p53 were graded in a semiquantitative fashion using a 0 to 3 + scale: 0, no staining; 1+, stained cells comprising <10% of the cells; 2+, stained cells comprising 10-30% of the cells; and 3+, stained cells comprising >30% of the cells. The calculations were performed at ×40 magnification. All the slides were evaluated blindly by two independent observers. Descriptive statistical analysis was carried out. Results on continuous measurements are presented as mean ± standard deviation (SD) (min-max) and the results on categorical measurements are presented as number (%). Significance is assessed at 5% level of significance. Chi-square/Fisher's exact test has been used to find the significance of study parameters on a categorical scale between the two groups. The age distribution of the subjects is given in [Table 1] and mean ages of the smokers was 47.20 ± 0.70 and of nonsmokers was 44.40 ± 13.40, respectively. The mean plaque index among smokers and nonsmokers was 1.32 ± 0.18 and 1.42 ± 0.35, respectively, and there was no statistically significant difference between the two groups. The mean bleeding index among smokers and nonsmokers was 71.61 ± 7.21 and 73.27 ± 8.40, respectively, which showed no statistically significant difference between the two groups, as depicted in [Table 2]. The mean probing pocket depth among smokers and nonsmokers was 5.57 ± 1.54 and 4.59 ± 1.22, respectively, which showed no statistical difference among the groups. The mean clinical attachment level among smokers and nonsmokers was 6.13 ± 0.81 and 5.46 ± 0.84, respectively, which showed a statistically significant difference with a P value of 0.036* and is depicted in [Table 3]. 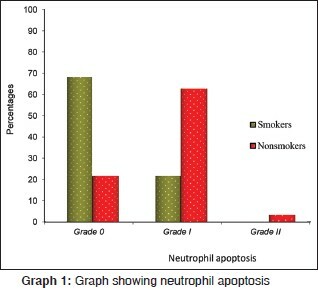 Grade 0 neutrophil apoptosis among smokers and nonsmokers was 11 and 4, grade 1 was 4 and 10, and grade 2 was 0 and 1, respectively. This showed that the incidence of grade 1 and grade 2 neutrophil apoptosis is statistically significant among the group of nonsmokers with a P value of 0.027* which is shown in [Table 4] and [Graph 1]. The [Figure 1] shows the apoptosis of neutrophils. Several studies have documented the levels of plaque score among the smokers and have found that there is an increased accumulation of plaque among smokers relative to nonsmokers. But several studies suggest that this concept is incorrect. In this study, we have a similar result where the plaque index is less among smokers compared to nonsmokers. The current study shows that there was an increase in the probing pocket depth and clinical attachment loss among smokers compared to nonsmokers. The results are in concurrence with the previous studies. Smoking has a significant effect on the periodontal attachment loss. These reports substantiate that smoking exerts local effects. In this study, there was a significant inhibition of the neutrophil apoptosis among smokers compared to nonsmokers. There have been reports on the effect of nicotine on the apoptosis of different cell lines; the survival of neutrophils cultured for upto 72 hours with nicotine was prolonged by suppressing apoptosis in a dose-dependent fashion. Nicotine induced internucleosomal DNA cleavage in myelogenous leukemic cells but not in mononuclear and polymorphonuclear cells,  nicotine inhibited apoptosis induced by the tumor necrosis factor in normal and transformed cells,  and it increased the expression of bcl-2 and inhibited apoptosis of lung cancer cells. Our investigation showed the inhibition of neutrophil apoptosis among smokers compared to nonsmokers, which results in lingering of the neutrophils for a prolonged period of time, leading to an increase in the cytokine level and causing breakdown of tissue. To the best of our knowledge, no other studies have reported neutrophil apoptosis in the gingival tissue of smokers and nonsmokers among patients suffering from chronic periodontitis. Hence, the results of this study could not be compared with any other published studies. However, a cell culture study on the survival of neutrophils cultured with nicotine has reported inhibition of apoptosis in a dose-dependent manner. The results of this study supports our observation indirectly. Certain activators of apoptosis require the presence of the p53 protein. p53 is a tumor-suppressor protein which, when active, induces genes related to cell cycle regulation, DNA repair mechanism, and the induction of apoptosis. The probable mechanism by which p53 promotes apoptosis is through the activation of cdc42 and inactivation of bcl2. Though p53 is present in normal tissue and cells, its short half-life make its expression almost undetectable in healthy normal tissues;  upon activation, p53 is stabilized so that its expression can be detected with anti-p53 antibodies using an immunohistochemical technique. Our data shows the presence of p53-positive cells in gingival biopsies of smokers suffering from periodontitis, which could support a p53-dependent apoptosis mechanism which is yet to be clearly defined. The limitations of this study are small sample size and the use of only p53 monoclonal mouse anti-human antibody for the detection of apoptotic cells. It is recommended that further research using a larger sample size, sensitive staining techniques, and better ways to overcome systematic errors may be undertaken to understand better the role of apoptosis among smokers and nonsmokers in patients suffering from chronic periodontitis. Based on the results of the present study, it could be concluded that smoking plays a role in the inhibition of neutrophil apoptosis in patients with chronic periodontitis. This might be the reason for the increase in the destruction of periodontal tissue and tooth loss among smokers suffering from chronic periodontitis. However, further research is warranted to understand clearly the role of neutrophil apoptosis in the destruction of periodontal tissue among smokers. The authors wish to thank Dr. Ramakant Nayak, Principal, Professor and Head, Department of Oral Pathology and Dr. Asawari Sant, Department of Pathology, Maratha Mandal's Nathajirao Halgekar Institute of Dental Science and Research Centre, Belgaum, for their help and co-operation in conducting the immunohistochemical analysis. They also acknowledge Mr. Suresh, Statistician, National Institute of Animal Nutrition and Physiology, Bangalore, for the immense help provided with the statistical analysis. 1. Gamonal J, Sanz M, Connor AO, Acevedo A, Suarez I, Sanz A. Delayed neutrophil apoptosis in Chronic Periodontitis patients. J Clin Periodontol 2003;30:616-23. 2. Genco RJ. Host responses in periodontal diseases: Current concepts. J Periodontol1992;63:338-55. 3. Chen Y, Zychlinsky A. Apoptosis induced by bacterial pathogens. MicrobPathog1994;17:203-12. 4. Elmore S. Apoptosis: A review of Programmed Cell Death. Toxicol Pathol 2007;35:495-516. 5. Leist M, Jaattela M. Four deaths and a funeral: From caspases to alternative mechanisms. Nat Rev Mol Cell Biol 2001;2:589-98. 6. Mariggio MA, Guida L, Laforgia A, Santacroce R, Curci E, Montemurro P, et al. Nicotine effects on Polymorphonuclear cell apoptosis and lipopolysaccharide-induced monocyte functions. A possible role in periodontal disease? J Periodontal Res 2001;36:32-9. 7. Renehan AG, Booth C, Potten CS. What is apoptosis, and why is it important? BMJ 2001;322:1536-40. 8. Bulut S, Uslu H, Handan B, Bulut OE. Expression of caspase-3, p53 and Bcl-2 in generalized aggressive periodontitis. Head Face Med 2006;2:17. 9. Crawford JM, James MA, Richardson P. Neutrophil die in the gingival crevice periodontal pocket, and oral cavity by necrosis and not apoptosis. J Periodontol 2000;71:1121-9. 10. Bartecci CE, Mackenzie TD, Schrier RW. The human costs of tobacco use. N Engl J Med 1994;331:907-12. 11. Bergstrom J, Preber H. Tobaccco use as a risk factor. J Periodontol 1994;65:545-50. 12. Grossi SG, Zambon JJ, Ho AW, Koch G, Dunford RG, Machtei EE, et al. Assessment of risk for periodontal disease. Risk indicators for attachment loss. J Periodontol 1994;65:260-7. 13. Eichel B, Sharik AH. Tobacco smoke toxicity, loss of human oral leukocyte function and fluid cell metabolism. Science 1969;166:1424-8. 14. Jarnberg F, Somogyi E, Dalton J, Gustafsson A, Klinge B. Quantitative assessment of apoptotic and proliferative gingival keratinocytes in oral and sulcular epithelium in patients with gingivitis and periodontitis. J Clin Periodontol 2002;29:1065-71. 15. Macgregor ID. Smoking and periodontal disease from: Drugs, diseases and the Periodontium. In: Seymour RA, Heasman PA, editors. Oxford: Oxford University Press; 1992. 16. Papapanou PN. Periodontal diseases: Epidemiology. Ann Periodontol 1996;1:1-36. 17. Gamonal J, Bascones A, Acevedo A, Blanco E, Silva A. Apoptosis in chronic adult periodontitis analysed by in situ DNA breaks electron microscopy, and immunohistochemistry. J Periodontol 2001;72:517-25. 18. Koulouri O, Lappin DF, Radvar M, Kinane DF. Cell division, synthetic capacity and apoptosis in periodontal lesions analyzed by in situ hybridisation and immunohistochemistry. J Clin Periodontol 1999;26:552-9. 19. Nobel RC, Penny BB. Comparision of Leukocyte count and function in smoking and non smoking young men. Infect Immun 1975;12:550-5. 20. Pabst MJ, Pabst KM, Collier JA. Inhibition of neutrophil and monocyte defensive functions by nicotine. J Periodontol 1995;66:1047-55. 21. Bulut S, Handan B, Alaaddinoglu EE, Oduncuoglu FB, Bulut OE, Demirhans B. Effect of cyclosporine A on apoptosis and expression of p53 and bcl-2 proteins in the gingiva ofrenal transplant patients. J Periodontol 2005;76:691-5. 22. Tonetti MS. Cigarette smoking and periodontal disease: Etiology and management of disease. Ann Periodontol 1998;3:88-101. 23. Van der Weijden GA, de Slegate C, Timmerman MF, van der Velden U. Periodontitis in smokers and non smokers: Intra-oral distribution of pockets. J Clin Periodontol 2001;28:955-60. 24. Bergstrom J, Floderus-Myrhed B. Co twin control study of the relationship between smoking and some periodontal disease factors. Community Dent Oral Epidemiol 1983;11:113-6. 25. Haber J, Wattles J, Crowley M, Mandell R, Joshipura K, Kent RL. Evidence for cigarette smoking as a major risk factor for periodontitis. J Am Dent Assoc 1993;125:1475-84. 26. Ah MK, Johnson GK, Kaldahl WB, Patil KD, Kalkwarf KL. The effect of smoking on the response to periodontal therapy. J Clin Periodontol 1994;21:91-7. 27. Clarke NG, Carey SE. Etiology of chronic periodontal disease: An alternative perspective. J Am Dent Assoc1985;110:689-91. 28. Sheiham A. Periodontal disease and oral cleanliness in tobacco smokers. J Periodontol 1971;71:743-51. 29. Preber H, Bergstrom J. The effect of non-surgical treatment on periodontal pockets in smokers and non smokers.ActaOdontolScand 1986;44:85-9. 30. Schenkein HA, Gunsolley JC, Koertge TE, Schenkein JC, Tew JG. Smoking and its effect on early onset periodontitis. J Am Dent Assoc 1995;126:1107-13. 31. Yoshida H, Sakagami H, Yamanaka Y. Induction of DNA fragmentation by nicotine in human myelogenous leukemic cell lines. Anticancer Res 1998;18:2507-11. 32. Heusch WL, Maneckjee R. Signalling pathways involved in nicotine regulation of apoptosis of human lung cancer cells. Carcinogenesis 1998;19:551-6. 33. Ko LJ, Prives C. p53: Puzzle and paradigm. Genes Dev1996;10:1054-72. 34. Thomas A, Giesler T, White E. p53 mediates Bcl-2 phosphorylation and apoptosis via activation of the Cdc42/JNK1 pathway. Oncogene 2000;19:5259-69.
shivanaikar, s. and faizuddin, m. and bhat, k.